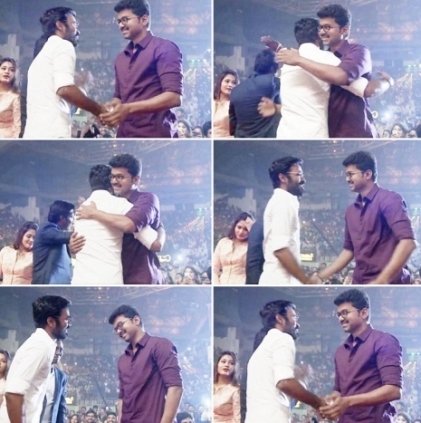 Dhanush, the VIP star, took everyone by a pleasant surprise by gracing the Mersal audio launch event. He told that he has come to the event, not as an actor or producer or director, but as Vijay's friend and a fan. Dhanush said, "This function demands this hugeness. Rahman sir and Vijay sir share 25 years in the industry, and it is the 100th film for Thenandal films. I've come here as Vijay sir's friend. Whenever he talks to me, he would put his hand over my shoulders, and that is why he is very much loved by all. I learned the real power of silence only from him. Thank you so much, Vijay sir, for being an inspiration to me, and to a whole lot of youngsters. Rahman sir, thank you so much for entertaining us with your music for 25 years. Atlee, I am closely following your works. You are doing it great, and I am eagerly awaiting to see the film FDFS." The show's anchor also told that Dhanush had cancelled all his appointments for this evening, just to make sure that he attends this big musical launch event. People looking for online information on Dhanush, Mersal, Vijay will find this news story useful.